The company’s headquarters are in Katerini, on the 3rd klm of the old National road that connects Katerini to Thessaloniki, built in a privately owned property of 17.000 sq. m. where all of its products are manufactured. The company’s facilities cover 9000 sq. m. in total: 5.000 sq. m. for manufacturing facilities and 4000 sq. m. for product storage. 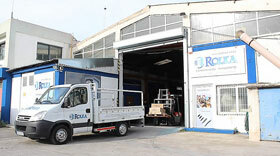 ROLKA has a branch office in Athens in order to cover for the needs of its customers in southern Greece as far as distribution and technical support is concerned. It is located in the area of Votanikos, on Iera Odos Street, in a building covering 1.400 sq. m. that provides plenty of space for product handling and storage, modern offices and easy road access.